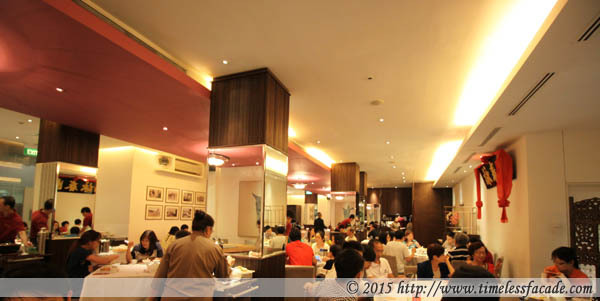 As it is known to be one of the oldest Chinese restaurants, we have patronised this place since our younger days holding birthday and wedding celebrations. When this restaurant moved to Chinatown, we hardly dine here as the place is squeezed and it was very hard to hold any conversations in this compact and noisy environment. 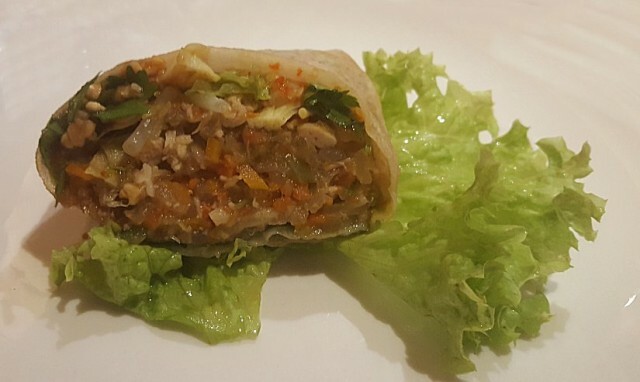 Spring Court Popiah ( $7.50 per roll ) – At this price, we expected the ingredients to be more unique or different but unfortunately, it tasted the same as those found in hawker centres or food stalls. Although the fresh prawns are bigger in size, we felt it could not justify the price being charged. 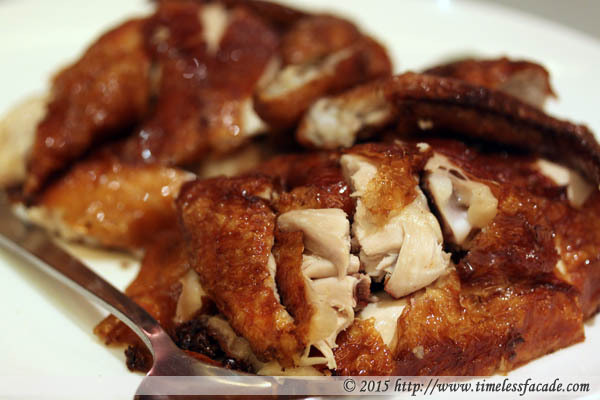 Roasted Chicken Stuffed With Minced Prawns ( $22.00 ) – We noticed that the name sound interesting but when this dish was presented, we were quite disappointed as we could not see, taste or find any minced prawns. Instead, it looked more like prawn paste mixture. The chicken meat also tasted bland with no seasonings at all. Since Spring Court was well known for their roasted spring chicken, we were expecting this dish to be at par or even better than their roasted plain chicken. Fried Mee Sua ( $19.00 ) – One of the items that we were quite satisfied as the mee sua ( vermicelli ) was fried with the right “ wok hei “ and it tasted delicious with the numerous ingredients like pepper corns, squids, juicy prawns and crunchy beansprouts. As the above dishes were recommended by the manager, we felt that it was highly priced including one pot of Chinese tea, towels and a small plate of pickled vegetable cost $13.20 for 4 of us. Total bill ( including 10% service charge and GST ) was $81.45. 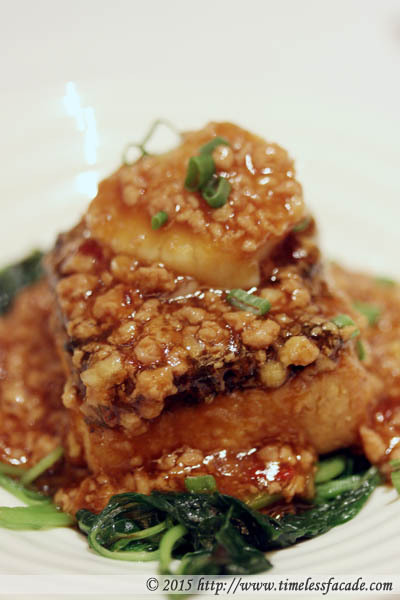 Braised Beancurd With Scallop - I used to think that serving up beancurd dishes by weight or individual portions were the purview of upmarket Chinese restaurants but clearly, Spring Court has decided to buck that trend. It would have worked if the dish tasted great but unfortunately, it was anything but. The beancurd lacked smoothness and the savouriness that I personally like. Topped with a small piece of scallop and draped over with a mildly starchy meat sauce that had bits of chilli in it. Average. Deep Fried Prawns With Salted Egg Yolk - The small portion had about 10 prawns or so (charged by weight) and came across as crunchy with a mild egg yolk taste (would have preferred something more pronounced actually). 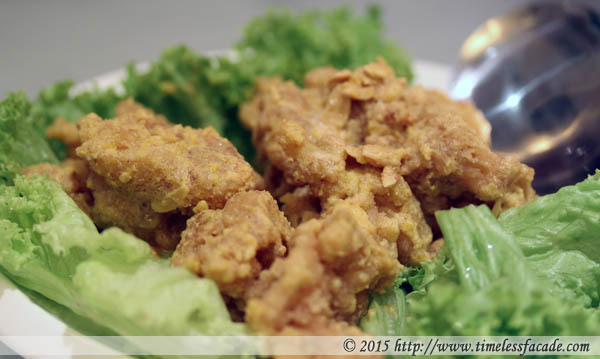 While decent, it lacked that savoury saltiness that is the hallmark of any good egg yolk prawn in my humble opinion. 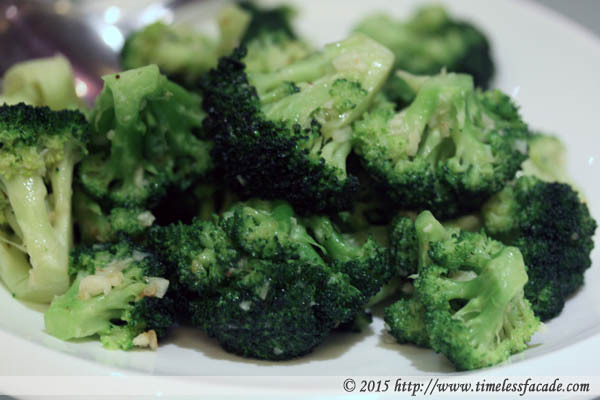 Stir Fried Broccoli - Cooked just right, the broccoli was neither too hard not soft but could do with some wok hei. Nonetheless, greens are always welcome as they help break the monotony of rich foods. 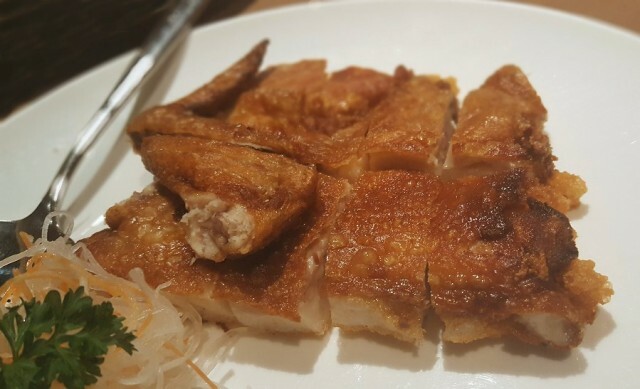 Roasted Chicken - Mildly crisp skin coupled with moist meat and a good pinch of saltiness; a respectably tasty dish of roasted chicken. Peking Duck - As part of a tie in with a credit card, a Peking duck was offered to us for a mere 85 cents (with minimum $85 expenditure). We opted to have the meat chopped up and served ($5 extra) over frying it with noodles ($12 extra) and to be honest, it was probably one of the worst Peking ducks I've had in a long while, on par with the sub $20 ones that go for sale at the Ubi area. The skin was mildly crisp but came wrapped in limp and dry crepes whilst the chopped up meat was rather oily and had a strong fowl taste to it amidst flittering hints of herbs. We gave up on it after a while. Lotus Leaf Rice - Apparently a signature dish of Spring Court and one that required pre-booking, the lotus leaf rice or 荷叶饭 had a slight waxiness to it (which was good) with bits of dried sausage, egg and shrimp. 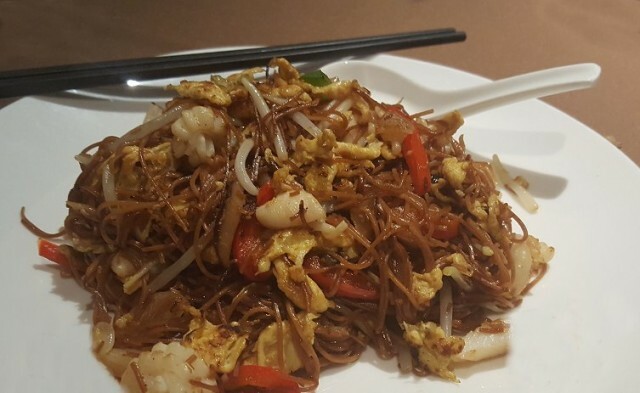 However I did find it a little lacking in fragrance and flavour, coming across as bland and nothing like the delicious 荷叶饭 at Peony Jade Clarke Quay. Thanks to the author of the review of Spring Court Restaurant. I recall the spring chicken from this restaurant in the good old days. This restaurant has been around for quite awhile . At that time the food was good and the prices from this restaurant at Chinatown were reasonable. After reading the review by GWEN, for my next special dinner occasion, Spring Court restaurant will be it. Hopefully the food is still as good as I thought!